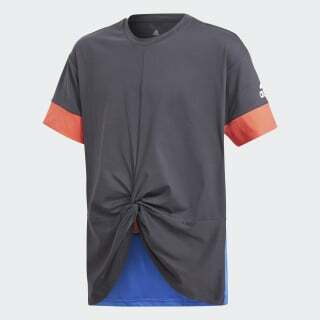 A loose-fitting t-shirt made to manage moisture. Face your workout head-on in this junior girls' training t-shirt. The stretchy tee features Climalite that wicks moisture so you stay dry through your regimen. With a roomy fit that allows for easy movement, it has a twisted front construction and blocks of colour for a touch of style.